It has been rumoured for a while that the Windows Phone 8.1 update will have a notifications centre to catch-up with iOS and Android and now we know it's going to be an all-action solution. For a start, isn't that way better than Notifications Centre? 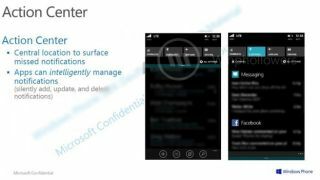 Secondly, judging by a 'Microsoft Confidential' email obtained by Winphollowers, it actually looks kinda neat too. The Action Centre shows applications segregated by icons, while there's also a 'Clear All' option and a chance to access 'All Settings' within the portal. According to the screenshot, and accompanying text, Action Centre is a "central location to surface missed notifications," while apps can "intelligently manage notifications," meaning you can choose which apps you wish to receive them from and silence others. There's also a toolbar offering quick access to Bluetooth, Driving Mode, Airplane and Wi-Fi settings with a single tap, much like the Android OS. Windows Phone 8.1 is expected to be detailed at Microsoft's Build conference in San Francisco on April 2.